What is a Corporate Health Coach Program? A corporate health coach program is a program in which individual employees are paired with professional health coaches in order to provide training, encouragement, education, goal setting, and valuable accountability for the employee. Health coaches work to assess the employees current and future health risks, their readiness for change and they address any potential threats and unhealthy lifestyle choices. Once a relationship is built, the pair works together to replace bad habits with good ones, make informed health decisions and set and achieve overall and specific wellness goals. What are the Benefits of a Health Coach Program? Health coaches provide confidence, accountability, and encouragement for employees on an individual basis. 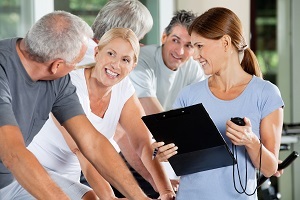 While other areas of your corporate wellness program may provide great opportunities for employees to make changes, this program is unique in its personalized approach. Many employees will greatly benefit from developing a meaningful relationship with someone who they can trust and rely on for great advice and help along the way. Attn. CEOs: If you are interested in implementing a corporate health coach program that is continually seeing great success, it is time to contact Wellworks For You. We assist companies of all shapes and sizes all over the world to prepare and maintain outstanding wellness programs. We believe that personalization is a key ingredient to successful wellness programs and that there is no better way to provide this for employees than incorporating health coaching into their daily lives.